Despite substantial support from surfers, the public, media and a handful of product sponsors, organisers of the Guinness World Record attempt for the ‘most surfers riding the same wave’ have been forced to postpone the 2011 Earthwave Beach Festival due to a lack of financial support. The fifth annual edition of the event, which promotes the surfing lifestyle and raises awareness of climate change and sustainable lifestyle choices, was schedule run at Surfers Corner on Muizenberg Beach in Cape Town on the weekend 1 & 2 October with a program of ocean and beach activities. 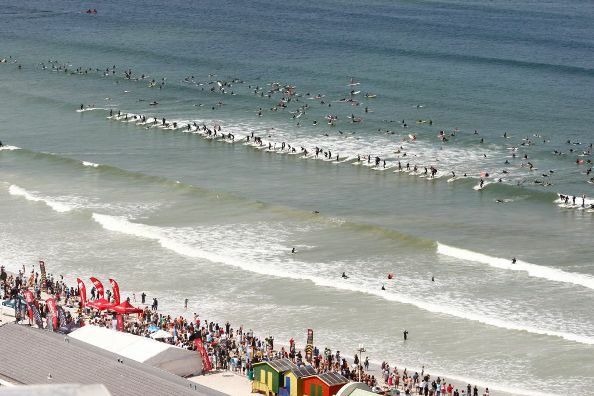 “We are really disappointed to have to call off this year’s Earthwave Beach Festival and Guinness World Record attempt,” said Paul Botha from Kahuna Promotions, organisers of the event where the current record of 110 surfers on the same wave was set in 2009. The Earthwave Beach Festival provides an ideal forum for promoting sustainable lifestyle choices to a receptive audience by leveraging the extensive media coverage and publicity generated through the record attempt and allied ocean and beach activities. The organisers also invite suggestions for attempts on other Guinness World Records that could be run at future festivals. See www.kahunasurf.co.za/kp/earthwave for details of the 2009 and 2010 Earthwave Beach Festivals at Muizenberg. Contact kahunasurf@mweb.co.za for further information on the Earthwave Beach Festival and sustainable lifestyles event and how to become part of this initiative.